There's a lot to be said for modest home builds, but if your budget can stretch to something more interesting and opulent, wouldn't it be silly not to have a go? We think so and this home will definitely make you think a bit more seriously about treating yourself and your family to the most outrageously luxurious home that your money can buy! Designed by an architect who clearly understood the importance of blending opulent aesthetics with inherent functionality, we just know that you're going to be blown away by the fabulous interior here, as well as the surprise in the rear garden, so let's stop talking and start looking! What a house! 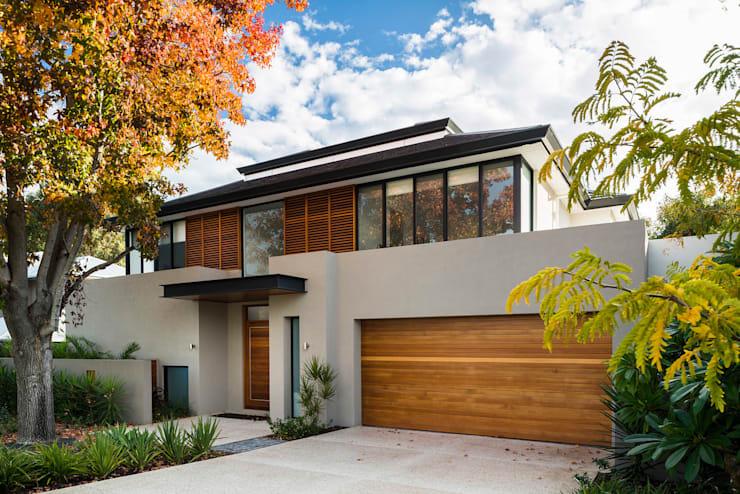 The use of bold lines and contrasting colours here makes for such a standout façade At first, your eyes are drawn to the crisp white segments, but then they get drawn up to drink in the amazing wooden accents and tantalising windows. A complex but exciting build, expectations are very high for the interior here! The way this room employs long proportions is just amazing and the directional wooden flooring really accentuates the fantastic size of the space! 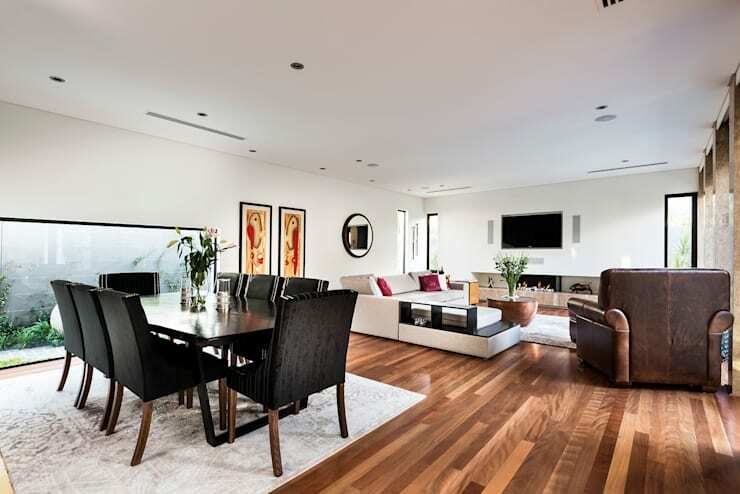 At the far end, a relaxed and sociable living room is centred around a feature rug, inset fireplace and wall-mounted television, while the dining space is clearly marked out just with one rug! While the main colour is white, the natural wood warms up the look and opulent black accents offer just enough contrast to keep the space interesting! Continuing the all-white theme, this kitchen, found behind the dining area, is a real beauty! 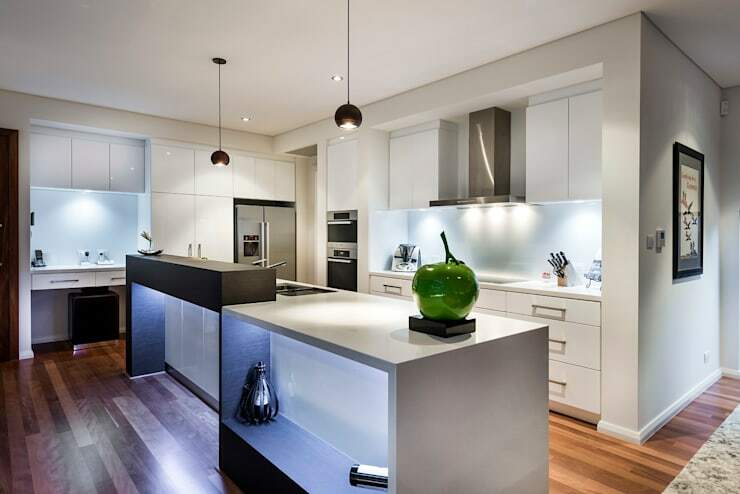 With a few dark accents and brushed stainless steel appliances, this area is all about the functionality, which built-in cabinets makes so easy! All the task lighting here is inspirational, as you really can't ever have too much of it in a kitchen and the quirky green apple really makes a fun addition too! Wow! 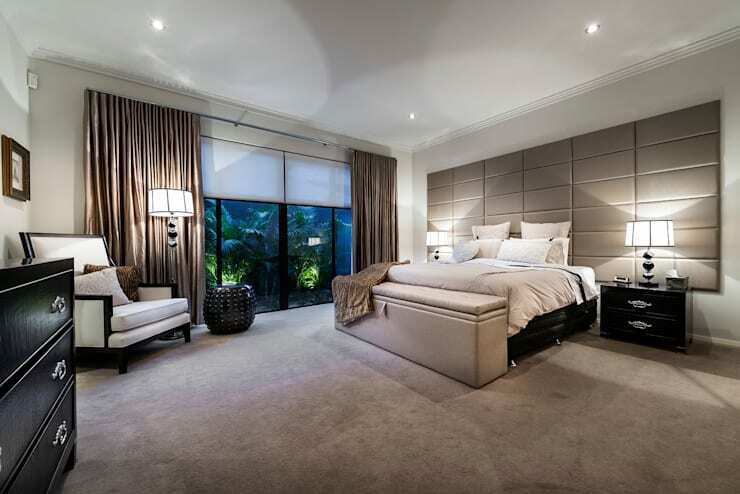 This is what we call a master bedroom! The size of the room is gargantuan and with pared back furniture, it looks even bigger. We always love to see deep pile, luxurious carpet in these softer spaces and while the view out is super, it's that headboard that really grabs your attention! 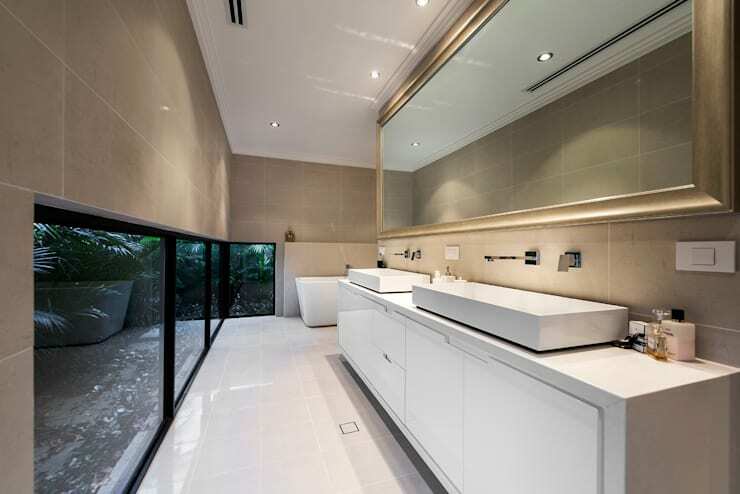 We've never seen low windows like this in a bathroom before, but what a way to maximise natural light intake, without compromising on privacy! The cool white and beige tones add a certain level of luxury here, as does the gilded mirror and by once again accentuating the length of the room, instead of the width, there is a really relaxing, natural feel. It probably isn't actually a surprise that a house this stunning would have a gorgeous outside terrace and pool, but the finish of them both is outrageous! 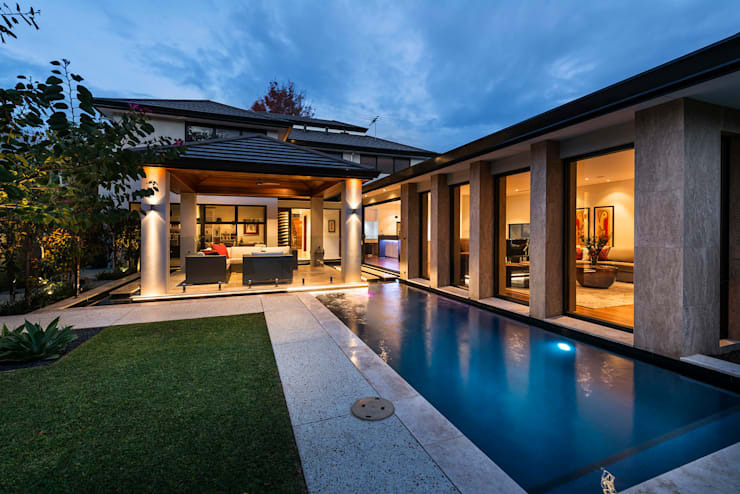 Adding a whole new dimension of opulence, this outdoor area would be wonderful all year round, but given that this house is in Australia, we doubt inclement weather is a concern! Wow! For more luxury home inspiration, take a look at this Ideabook: Clifftop luxury in Phuket.